The China bears have been around for years, continuously predicting the end of China's stellar growth story. In 2012 Michael Pettis expected annual growth to average 3% over this decade and in 2015 Tyler Cowen warned of an imminent disastrous financial collapse. So far, so good. China's unsustainable double-digit growth came to an end in 2008, coinciding with the global financial crisis. Growth was artificially stimulated for a couple of years but only by huge fiscal and financial stimulus. Since then growth has settled to a still-outstanding 6.5%, but credit has grown much faster than nominal GDP – a classic forewarning of a financial crisis. The International Monetary Fund and the OECD have both identified this as a priority policy concern. Just about everyone (including the Chinese authorities) agree, but there is a wide range of views on how all this will play out. China's debt to GDP ratio isn't all that extraordinary by simple global comparison: it is about the same as many OECD countries (including Australia). The danger comes from the rate of growth and the fact that the debt level is much higher than other countries at China's stage of development. 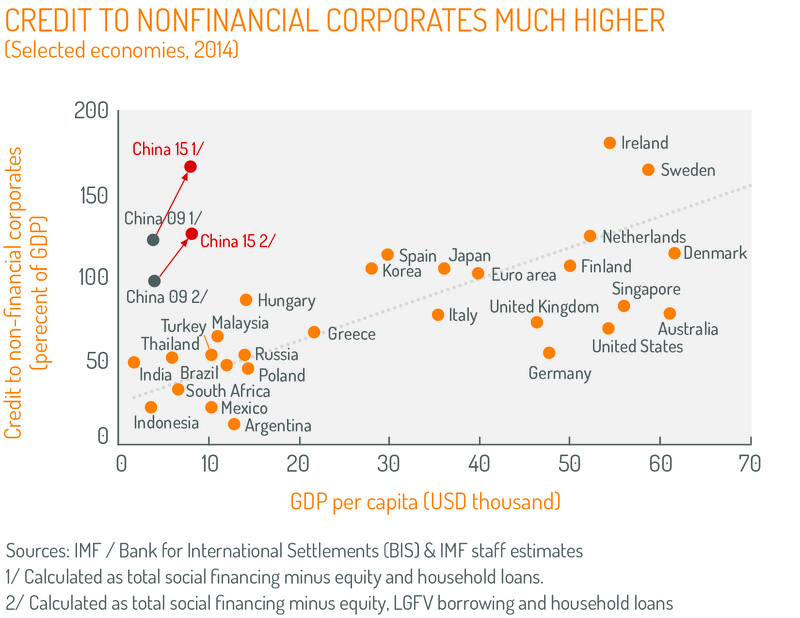 As countries grow, their financial sectors deepen and higher debt ratios are normal. But China, only half-way through the development process, has the debt levels of a mature economy, and the ratio is still growing. The level of corporate debt, especially, is way out of line. That said, comparisons with other financial crises take us only some way to understanding how this is likely to evolve. The IMF makes comparisons with financial crises in Japan (1990), Thailand (1997) and Spain (2010), but these were quite different from China's current situation. Take Thailand, devastated by the Asian crisis. Many things went wrong, but the driving macro-economic factor was excessive capital inflows in the years leading up to 1997 (capital inflows equaled 13% of GDP in 1996). This overwhelming inflow inflated asset prices, pushed up the exchange rate to uncompetitive levels and opened up a large current account deficit. When the foreign investors realised what was happening, they left in a rush ('capital reversal'), triggering a plummeting exchange rate, collapse of asset prices and bankruptcy of the financial institutions which depended on the capital inflows. China's macro-economic challenge is quite different. It has no dependence at all on foreign savers to fund its investment. It runs a current account surplus, with modest net capital outflow for most of the past three years. Foreign exchange reserves have fallen but are still around $US3 trillion. China retains capital controls which would limit any sudden dramatic exodus. Thus capital reversal is not the concern. Nor does China have much in common with America's financial crisis in 2008: the hair-trigger liquidity funding that doomed Lehman Brothers or the complex layers of securitisation that brought AIG down are not present in China's simpler financial sector. China's problems are more like the financial deregulation experience in the advanced economies a couple of decades ago – the US with the S&L crisis in the 1980s and Australia in 1990. The intrinsic nature of deregulation results in credit (and the financial sector) outpacing the growth of the economy, with financial institutions misusing the newly deregulated freedom to get themselves into trouble. In this heady transition of financial deepening, some poorly-managed financial institutions emerge and some bad lending decisions are made. This has been the universal experience, and has inexorably led to some kind of financial crisis. Thus the issue for China is not whether it will repeat the Thai experience of 1997 or the Spanish experience of 2010. Solving China's financial-sector problems doesn't depend on the fickle favours of the global financial sector. Instead, China has to address some domestic problems: the non-performing loans and the flawed financial institutions that made them. In facing this task, China has a big advantage: this challenge doesn't come as a total surprise, as the Thai crisis, the S&L crisis and the 2007 global financial crisis did. Policy-makers have time and opportunity to ameliorate the crisis. What should the Chinese authorities do? First, there is the micro-level problem of resolving the accumulated bad debts. The IMF estimates that potential losses from bad loans may amount to around 7% of GDP. This will be painful to absorb but can be spread over several years. It will be a fraught political issue to allocate the pain between those who funded the loans (who may see themselves as bank depositors rather than 'at-risk' investors), the financial institutions that made the bad lending decisions, the borrowers who can't pay back, and the taxpayers via the budget. But this is no more difficult than the adjustments China has made over the past couple of decades. The key challenge is to ensure that the financial sector emerges from this process stronger and better able to perform its intermediation function. China's saving remains huge (well over 40% of GDP) and financial deepening offers the promise of shifting these funds more efficiently into the most profitable investment opportunities. In an underdeveloped financial sector, investment is largely self-funded. For example, state-owned enterprises put their retained earnings into the management's pet projects, rather than channeling these funds to the higher-return projects in the wider economy. China should recall the advice of Rahm Emanuel and (supposedly) Winston Churchill: never let a good crisis go to waste. They should use the impending painful adjustment to achieve a more efficient financial sector. Without wanting to sound too starry-eyed, just imagine if the authorities used the opportunity to drastically restructure zombie state-owned enterprises that have too much debt. History would record this not as a damaging crisis, but as a policy-making triumph. The second challenge is at the economy-wide macro level: to maintain the pace of GDP growth while trimming back the rate of credit expansion. Derek Scissors of the American Enterprise Institute predicts 'years of stagnation'. But it's not as if credit growth has to be drastically curtailed: it needs to be trimmed back so that it rises no faster than the pace of nominal GDP growth (thus keeping the debt to GDP ratio from rising further). 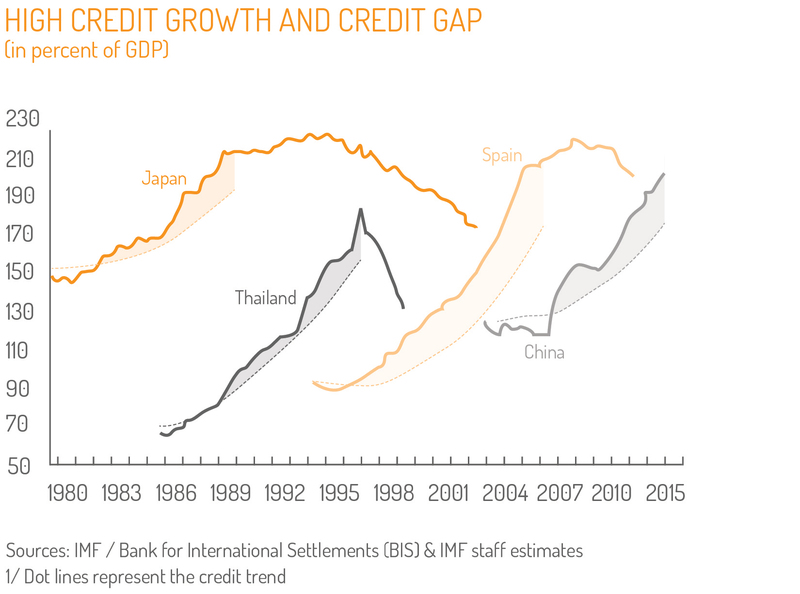 If China succeeds in its structural switch to consumption-driven growth, this would reduce the need for credit expansion. If, as well, the financial sector does a better job of intermediating saving and investment, this would allow growth to continue with less credit expansion. All this will be tricky to implement, but it is worth recalling that China achieved its pre-2007 double-digit pace of growth in a period when credit was growing only modestly. Asia now dominates world growth (accounting for 70% of the IMF's World Economic Outlook growth forecast and nearly as much in the latest ADB forecasts). How well China succeeds in reforming its financial sector will be important for global growth, and vital for us here in Australia.